Avalanche is a free Yahoo Widget that lets you access Basecamp right from your desktop. 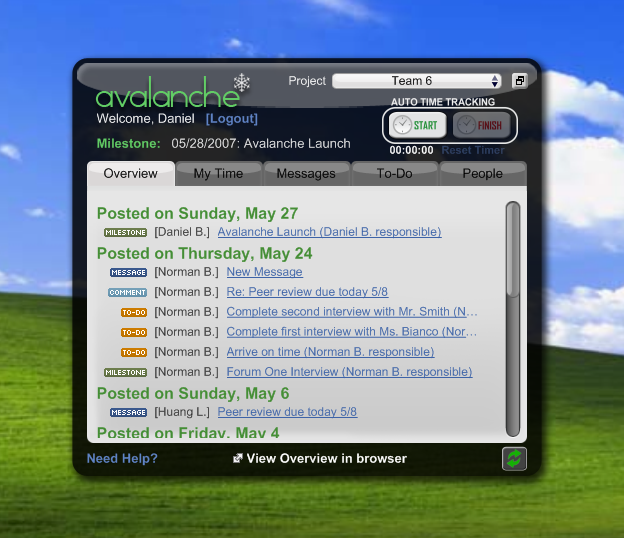 Features in Avalanche that are not offered by the Basecamp website include automatic time entry, spreadsheet time report generation, time estimate tracking, and contact exporting. Automatic time entries allow you to clock in and out while performing tasks. This gives you more accurate time entries, and helps keep track of your project activity. Notifications of new data can be seen in the Widget dock, as well as in the Overview tab title. Our story is that we developed this for a semester-long class project in a team of 6, and that our program had just started using Basecamp to manage all of the student projects. My team had been using the widget throughout the semester, and our advisor was happy with how accurate our time reports were (considering most of the other teams made up their reports the day before the daily meeting). For me personally, I'm happy with all the value-added functionality that Avalanche provides on top of Basecamp, such as the support for time estimates and more relevant time reports, as well as the ability to export all of your contacts for import into Calendar programs. All of the advisors were happy with the project, and will be recommending that future project teams use the widget to better manage their projects, and they are hopeful that their teams will no longer have to make up their time reports right before they are due. Lastly, I think our widget was another reason for our department to stick with Basecamp in the future, as I suspect this last semester was a trial to see if it was better than what we had used in the past (a website developed by a student team a few years ago).